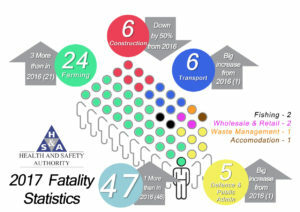 According to figures released by the Health and Safety Authority (HSA), 47 people lost their lives in work related accidents in Ireland in 2017. 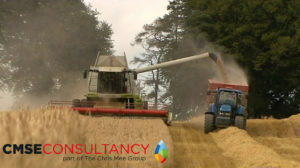 For the 8th year running agriculture had the highest number of work related fatalities with 24. Of the 24 fatalities, 14 were men over 65 killed and one fatality was a child. The transport sector had six fatalities. Accidents involving vehicles accounted for 21 of all fatalities in 2017. Of 47 fatalities reported, 18 were self-employed persons, 15 were employees, seven non-workers and seven family workers. Chris Mee Group is an industry leader in the areas of Behaviour Based Safety (BBS) and Observational Based Safety programmes. Click through to our Behaviour Based Safety (BBS) information pages to find out more about how BBS systems can help you to reduce accidents.